We have two Boston terriers. We also have a young female Boxer, but that isn't part of this story. That makes three dogs, which is one too many and that also isn't part of this story. The oldest Boston, a female, has always been protective, barking and sometimes snapping at anyone approaching my wheelchair. 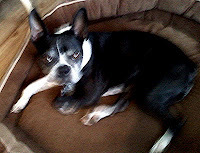 She's ten years old, and the male Boston is five years old. Sadly, the male picked up the females aggressive tendencies, and he has grown so protective, so territorial that he is much harder for me to control than the female. That's really no problem since we have a fenced backyard, except Doc, the male Boston, has grown to hate our neighbor. The man says he likes dogs, but whenever a barking dog runs toward him the man throws rocks. The situation is exacerbated by our property lines. Both lots in this suburban development are triangular, and the way our two houses are oriented, there is perhaps two hundred and fifty feet between our front doors, but we own two hundred feet of that (unfenced) space. Thus, if I happen to let the dogs out the front door, perhaps when I go out or when its raining and they need to be tricked into a potty break, I try to make certain no one is outside. I didn't on a cold, rainy Monday morning, and Doc ran toward our neighbor who was pushing his garbage cart to the end of his lane. Doc never left our property, but the neighbor launched a rock barrage that sent Doc back to our house. And then the man knocked on our door to complain. Justifiably. I should have let the dogs into the fenced backyard, but I was passing the front door, and it was raining (which the dogs hate), and the front door was a trick to get 'em out ... but, I was wrong, and I apologized. The new incident, I think, is a sign Doc needs a new home. There have been others. Once Doc tried to chase the neighbor while the man was on a riding lawnmower. The man was greatly upset at that, although I failed to see that Doc might have done any harm. But the neighbor has grandchildren who stay regularly, and they play in his front yard, and I cannot bear the thought of a child being bit. Or the lawsuit. But in today's economy, with people abandoning animals as they leave their foreclosed McMansions, I don't know that I will be able to do so. So far, neither word-of-mouth or Craiglist have been any help. Doc is perfectly healthy -- and quite a loving, happy fellow among people he knows -- and so putting him down as "aggressive" would be wrong.